We extend our methods from Scholze (Invent. Math. 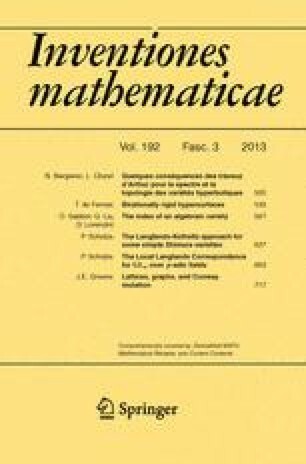 2012, doi: 10.1007/s00222-012-0419-y) to reprove the Local Langlands Correspondence for GL n over p-adic fields as well as the existence of ℓ-adic Galois representations attached to (most) regular algebraic conjugate self-dual cuspidal automorphic representations, for which we prove a local-global compatibility statement as in the book of Harris-Taylor (The Geometry and Cohomology of Some Simple Shimura Varieties, 2001). In contrast to the proofs of the Local Langlands Correspondence given by Henniart (Invent. Math. 139(2), 439–455, 2000), and Harris-Taylor (The Geometry and Cohomology of Some Simple Shimura Varieties, 2001), our proof completely by-passes the numerical Local Langlands Correspondence of Henniart (Ann. Sci. Éc. Norm. Super. 21(4), 497–544, 1988). Instead, we make use of a previous result from Scholze (Invent. Math. 2012, doi: 10.1007/s00222-012-0419-y) describing the inertia-invariant nearby cycles in certain regular situations. First of all, I thank my advisor M. Rapoport for explaining me the Langlands-Kottwitz method of counting points, which plays a crucial role in this article, for his encouragement to work on this topic, and for the many other things he taught me. Furthermore, my thanks go to Guy Henniart and Vincent Sécherre for their advice in type theory, among other things. Moreover, I am grateful for the financial support of the Hausdorff Center for Mathematics in Bonn, and the hospitality of the Institut Henri Poincaré and Harvard University, where part of this work was carried out.